Most travellers don’t spend much time in Honduras. Backpackers hop the border at Copán to visit the ruins then bus straight to the Bay Islands to get their scuba diving ticket. Cyclists usually cut straight through, avoiding any side trips and, for once, I don’t blame them. 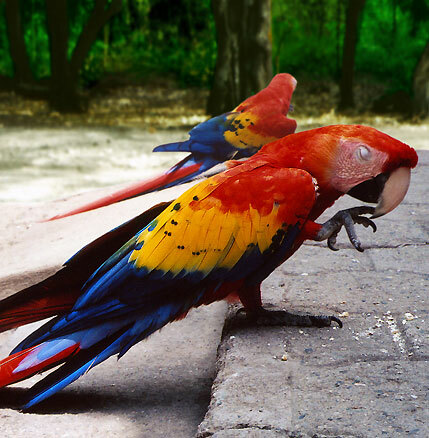 Honduras will exhaust the patience of even the most easy-going traveller. No, it’s not all bad, but the best I can say about Honduras is that it’s constantly challenging and occasionally rewarding. Riding in relentless heat along busy mountain roads, you’ll occasionally get a good panorama or a close encounter with nature. But the real problem – and it pains me to say this – is the people. Now, before I go any further, allow me to qualify that last statement: I have met honest, decent, helpful Hondurans on my travels here. Fermín, a friendly security guard and bicycle enthusiast in Copán Ruinas, fixed my rear wheel because the town had no bike shop. He repaired it at night in his home workshop and brought it to work the next day, as good as new. He refused any payment for this service. There are good people in Honduras. Road sign. 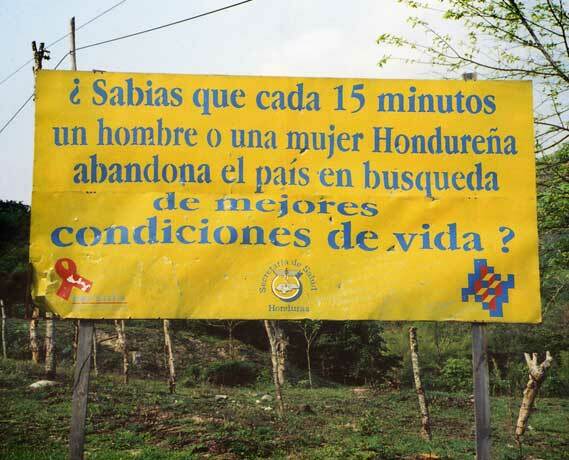 “Did you know that every 15 minutes a Honduran man or woman leaves the country in search of better living conditions?” I can’t blame them. Unfortunately, there are also plenty of pendejos. The men sit with their shirts rolled up over their fat guts, noisily clearing their throats and spitting on the ground as you pass (foreign women can expect vulgar remarks and lewd gestures as well, even if accompanied by a man). The women call you gringo to your face, then talk about you when your back is turned, assuming you don’t speak Spanish (I do, and I don’t like what I hear). Even in the campo, where you’d expect a more laid-back attitude, people yell insults, laugh, and point as you ride by. Climbing slowly past them uphill is infuriating, knowing that all you can do is ignore them and keep pedalling. I don’t really blame Honduras–it’s had a difficult history. Enslaved to the US for a century (first as a banana republic; later as a staging ground for the illegal Regan-era terrorist war against Nicaragua) Honduras has always been Central America’s unloved middle child, forgotten somewhere between the colourful Mayan culture of Guatemala and the proud self-awareness of Nicaragua and El Salvador. Even the geography seems to have forgotten Honduras. While the other Central American republics have all reaped the benefit of rich volcanic soil, Honduras is virtually devoid of volcanoes. Today, Honduras is known for having the highest murder rate in the world. That’s right, the world! According to a recent BBC documentary, there is a violent death every 74 minutes here (Mexico’s murder rate is only a quarter that of Honduras). Not surprisingly, many Hondurans feel their best option is simply to leave. 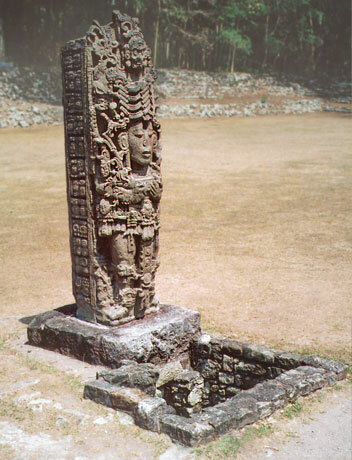 “Stela A” at Copán Mayan ruins, one of Latin America’s best archaeological sites and the high point of any trip through mainland Honduras. Honduras is mostly mountainous, especially in the south. 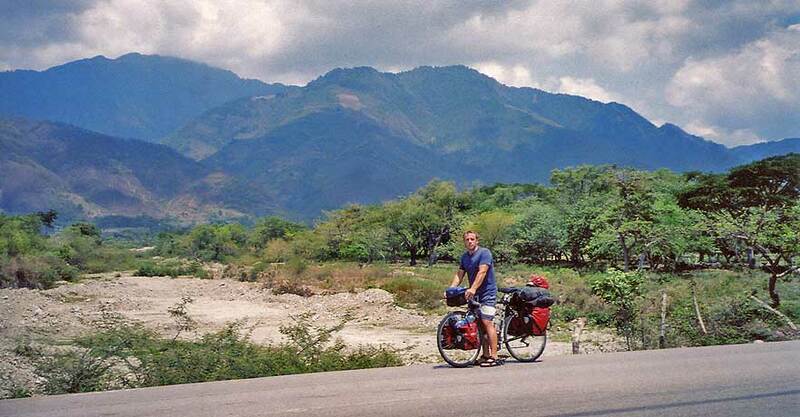 The most dramatic descending and climbing is between La Entrada and Nueva Ocotepeque, cutting across the Cordillera de Celaque to El Salvador. It’s a tough, up-and-down slog through this section, but superb views over the heart of Central America await you at the top of each climb. The paved road between Copán Ruinas and La Entrada weaves through steep, hills covered in pine trees and green meadows. Some areas are hot and dry with surprisingly sparse vegetation, making it hard to find a secluded spot to camp. There are two main flat areas in Honduras. The department of Gracias a Dios, in the extreme north east, is a flat, swampy, thinly populated zone, virtually devoid of roads. If you travel in this area, it’s unlikely it will be by bike. The flat area you’re more likely to ride is near the Gulf of Fonseca, on Honduras’ small Pacific coast. You will get only one brief glimpse of ocean in the distance as you ride by San Lorenzo. Otherwise, this is a dry and unappealing landscape. The word “honduras” means “depths” and Honduras is so named because Columbus, it is claimed, once said of this area, “Gracias a Dios hemos salido de esas honduras” (“Thank God we have left those depths”). I remember feeling the same way when I left Honduras. Near Antigua Ocotepeque, heading to the border with El Salvador. 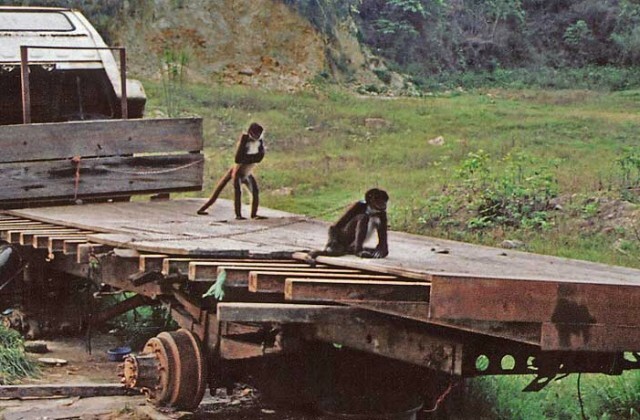 Feature image (top of page): Chained spider monkeys on the road to Santa Rosa.